"Halifax Town" redirects here. For the club of the same name that ceased to exist in 2008, see Halifax Town A.F.C. "The Shaymen" redirects here. It is not to be confused with The Shamen. F.C. Halifax Town is a professional association football club based in Halifax, West Yorkshire, England. The club participates in the National League, the fifth tier of English football, and play at the Shay. They replaced Halifax Town A.F.C., which went into administration in the 2007–08 season. Huge tax debts buried Halifax Town A.F.C. after almost 100 years as a football club. New figures put to a reconvened creditors meeting in May 2008 showed the cash-strapped Shaymen owed over £800,000 to Her Majesty's Revenue and Customs. The Revenue refused any deal and that effectively finished the club – already over £2 million in the red. Administrators had been trying to broker a rescue package but speaking after five hours of talks that left liquidation near inevitable, administrator Rob Sadler said: "Halifax Town will probably perish." It was originally thought the club owed the taxman around £500,000, which might have left scope for a deal. But the news that it owed £814,000 meant that even if all the other creditors had accepted the 2.5p-in-the-pound offer originally on the table it would not have been enough. At a meeting of the Football Association, discussing the makeup of the football pyramid for the 2008–09 season, FC Halifax Town were not placed in either the Conference Premier, the Conference North or the Northern Premier League Premier Division. Halifax appealed against the decision to remove them from the Football Conference. Though the appeal was rejected on 11 June, the hope was that Halifax could play in the NPL Premier Division. This did not materialise, and eventually Halifax Town were accepted to play in the Northern Premier League Division One North in the new season under the new name F.C. Halifax Town. The club's first game under the new name F.C. Halifax Town was a friendly away against Tamworth on 19 July 2008. There was to be no fairytale ending however, and the game ended in a 2–0 defeat. The club's first ever victory was against Alsager Town on 26 July 2008 by a 2–0 scoreline. Colin Hunter scored the new club's first ever goal after six minutes. Their first competitive Northern League Division One North match was at The Shay against Bamber Bridge on 16 August 2008, but the game resulted in a 3–0 loss for the Shaymen. The club got off to a poor start, despite recording their first competitive victory in the next match. However, a 7–1 home win against Salford City in late September seemed to turn the tide for Town. They went on an 8-game unbeaten run, 7 of those being victories, and shot to the top of the league table. The run eventually came to an end against Rossendale United, who ended up doing the league double over Halifax and finishing the season bottom of the table. Despite the loss, Halifax remained top and more good results, including 5–1 and 4–1 victories against Garforth Town and Wakefield respectively, kept their promotion hopes alive. After the Wakefield match however, Halifax won just 2 of their final 14 league games, the wins coming against Harrogate Railway Athletic and Clitheroe, both 2–1. This poor run led to the sacking of manager Jim Vince, and senior player Nigel Jemson stepped up to the manager's position for the remainder of the season. The automatic promotion places were certainly out of Halifax's reach going into the final 5 games, but the club needed to win a minimum of 3 of these final 5 games to have any chance of reaching the play-offs. They could only manage 2 draws and so a poor ending to the season cost them dearly, and they had to settle for a final position of 8th. With new manager Neil Aspin taking the helm near the start of close season, Halifax Town got off to a much better start. Promising results in pre-season friendlies were consolidated after beating Colwyn Bay 3–0 on their own turf in the first league match of the season. The results continued to be impressive, most notably in September, winning every game and conceding only one goal in the process. This included a 2–0 away victory over promotion-pushing Conference North team Droylsden, before coming to a home defeat to Wrexham in the Fourth Qualifying Round in front of a then record gate for Halifax Town, 2,843. Furthermore, first-choice goalkeeper Jonathan Hedge was called up for the England C national football team. Halifax's glory streak faltered a little after losing 1–0 away to Prescot Cables in the only game during the season where they failed to score. Halifax failed to record a game for over a month during the heavy weather in the winter, and Lancaster City dominated the promotion race for a while. However, Halifax continued to rake up impressive results, and during a congested schedule beat Ossett Albion 5–0, and Harrogate Railway Athletic, Prescot Cables and Colwyn Bay 3–0 apiece among other results. A decisive moment came against Garforth Town away, when, after a Garforth substitute being sent off, Halifax came back from 3–1 down to win 3–4 in the last stoppage time. That following Saturday, 10 April, Halifax faced Lancaster City at home, beating them 4–0 in front of a new record gate, 3,152. This result gained Halifax points over Lancaster for the first time since the beginning of the season. The Shaymen followed this excellent result on Monday 13 April by beating 3rd placed Curzon Ashton away 5–0. They held onto the top spot until the end of the season, becoming champions of the Northern Premier League Division One North with 100 points. The title was sealed with a 2–2 home draw against Clitheroe after beating Ossett Albion away 4–2 the previous Saturday in front of over 1,000 travelling supporters. Halifax started life in the Northern Premier League by making numerous signings, notably former Bradford City captain Mark Bower from Darlington and forward Jamie Vardy from Stocksbridge Park Steels, a player who would go on to lift the Premier League title six years later with Leicester City. The Shaymen began the season how they would have wanted, winning their inaugural match at this level 2–1 against Buxton at the Shay, however draws against Frickley Athletic and Colwyn Bay plus a defeat at fellow newly promoted side Chasetown left Town in 13th position. However things did pick up; Town were unbeaten in their next twelve league games, winning a remarkable eleven of them to send the Shaymen six points clear of nearest challengers Colwyn Bay, and having played two games less than them. Within this unbeaten run, Halifax also played host to Conference Premier side Mansfield Town in the fourth qualifying round of the FA Cup, although like the previous season they succumbed to a narrow defeat. A shock home defeat against North Ferriby United was just an anomalous result in the league campaign. On New Year's Day 2011, Town hosted FC United of Manchester at the Shay which attracted a crowd of 4,023, an attendance that at the time held the record crowd for the Northern Premier League. Halifax won 4–1 having been losing at half-time, goals from Mark Bower, Greg Maguire scoring and further assisting Adam Morning with two goals in 5 minutes; they'd beaten the Red Rebels three weeks prior at Gigg Lane in the return fixture. Victory at Northwich Victoria and an emphatic 8–1 home win against Ossett Town in mid-January, FC Halifax Town's biggest ever win, settled minor worries after going down 2–1 at bogey side Colwyn Bay and the Shaymen continued to win games at will despite the odd hiccup. Halifax won an incredible match against Chasetown in late March, with four of the five goals in the 3–2 win coming very late on after Town had gone behind. Halifax had the chance to wrap up the championship at home to Matlock Town but a late penalty for the visitors meant Town had to wait. They finally won the title after winning 2–0 at Retford United and gained automatic promotion to the Conference North. This was their second league title in as many seasons. After two incredible seasons, there was a belief around the club that three consecutive promotions could be on the cards. A good pre-season increased optimism but everyone was brought back down to earth after Town lost their opening game at home to Corby Town. A close-fought encounter at Blyth Spartans ended in victory for the Shaymen but this win was succeeded by four consecutive draws. Meanwhile, star striker Jamie Vardy was bought by Fleetwood Town and after having a very successful season was snapped up by Championship outfit Leicester City. Defeats against Hinckley United and Vauxhall Motors didn't help the cause and Halifax were languishing in 16th place with only two wins from their opening nine games. This wasn't good enough and the team responded, winning four of their next six games including a victory against eventual league champions Hyde. Despite the poor league form, Halifax were enjoying a good run in the FA Cup; the club reached the first round for the first time since their reformation and were drawn at home to Charlton Athletic who were five points clear at the top of League One at the time. The tie was selected to be shown live on ITV1. Town gave a very good account of themselves despite going down 4–0 after three late goals. The record attendance for the club was also broken, with a crowd of 4,601. A sluggish period after the highs of the Charlton game were quickly forgotten after Halifax went on a ten-game unbeaten run, propelling them from 13th position to 3rd, a position around which they stayed for the remainder of the season. Defeats against Nuneaton Town began an inconsistent run which led to a nail-biting end to the season in the race to make the play-offs. Town lost away at fellow play-off hopefuls Stalybridge Celtic but three wins from the final four games secured a 3rd-place finish. Halifax faced Gainsborough Trinity in the play-offs, a side who they hadn't lost to in the regular season, however after going 2–0 down at the Northolme they came back to draw the first leg 2–2. In the second leg, Town went down 1–0 despite having more of the ball throughout the game but poor finishing meant that they had to settle for another season in the Conference North. The season began with somewhat of a cull of the previous season's squad; only nine members of that squad were initially retained for the upcoming season. Numerous high-profile signings were made in the close-season including former Huddersfield Town captain Jon Worthington, ex-Wigan Athletic midfielder Jason Jarrett and strikers Dale Johnson and Gareth Seddon from Droylsden and Conference Premier champions Fleetwood Town respectively. The duo had formed a prolific goalscoring partnership at Hyde between 2006 and 2008. Following these signings, Halifax were installed as the pre-season favourites for the Conference North title ahead of fellow phoenix and ex-league club Chester. The Shaymen's season began as they would've wanted with a 2–1 victory against the most southerly side in the division Bishop's Stortford, despite falling behind. Another defeat against Colwyn Bay was followed by a 5–1 drubbing of Workington before a draw at neighbours Bradford Park Avenue. The Shaymen struggled to find consistency in the early stages and after their draw at the Horsfall Stadium they already found themselves 5 points adrift of joint league leaders Guiseley, Brackley Town and Chester. A loss at Chester in September was followed by a good run, which included the start of Halifax's FA Cup and FA Trophy runs. The Shaymen reached the fourth qualifying round of the FA Cup, bowing out 2–0 to Lincoln City in a replay at the Shay, after having given the Conference side a good run for their money in a goalless draw at Sincil Bank. The Trophy saw Town fare better than in the Cup, reaching the quarter-finals but eventually ending up on the wrong end of a 3–2 defeat to another Conference side in a replay, this time in the form of Dartford. During the middle of the season, Town experienced a large number of fixture postponements due to their involvement in the cups, the poor weather and the poor drainage system at the Shay, causing the pitch to become easily waterlogged. Incidentally Halifax's home league tie in February against Stalybridge Celtic had to be moved to Rochdale's Spotland Stadium. By the start of February, Halifax had ten games in hand on runaway leaders Chester and were 41 points behind them. The continuation of the foul weather left Halifax having to play 12 league games in 27 days in April. Many fans thought that such a backlog of fixtures would tire the players out and cause them to miss out on the playoffs entirely, after having been in the mix even with so many games in hand. The Shaymen only won 2 of these 12 games but still made it into the playoffs fairly comfortably to finish the season in 5th place. Town were paired up with local neighbours Guiseley in the playoff semi final after they had finished in 2nd place. A 1–1 draw at the Shay left things finely poised for the second leg at Nethermoor. Halifax managed to pull off an excellent 2–0 victory which was thoroughly deserved against the side who finished 16 points ahead of the Shaymen. Halifax were through to face Brackley Town away in the playoff final. A close match was fought between the two sides whose league games had both finished goalless. The match was won by a 75th minute Lee Gregory goal to send Halifax Town back into the Conference Premier after a five-season absence following their demotion. Two days later Halifax faced Guiseley again, this time in the final of the West Riding County Cup at Valley Parade. They won 1–0 in extra time thanks to a Gareth Seddon goal to win their second trophy in three days after overcoming Liversedge, Albion Sports and Ossett Town in previous rounds. They scored eleven goals without reply on their way to the trophy. The 2013–14 season began with manager Neil Aspin signing a new two-year contract which would keep him at the Shay until 2015. The pre-season activity started with the permanent signing of loanee Matty Pearson who had been released by Rochdale. Neil Aspin bolstered his promoted squad by signing, amongst others, Guiseley top scorer Josh Wilson, Adam Smith from Lincoln, Simon Ainge from Luton and unknown entities Marc Roberts and Lois Maynard from Buxton and Winsford United respectively. There was to be no dream start for the Shaymen upon their return to the Conference. Despite taking a 1–0 lead at promotion contenders Cambridge through Lee Gregory's goal, Town quickly hit self-destruct and saw captain Danny Lowe and goalkeeper Matt Glennon sent off for professional fouls. The final score was 5–1, but the Shaymen did as best they could considering they played 70 minutes with 9 men. The first victory of the season came just two days later against Wrexham who had narrowly missed out on promotion the previous season in the play-off final. Halifax continued to have some good results and after a win against recently relegated Barnet in September, their first defeat of the season, they found themselves in the play-off places, to the surprise of many. But as the season wore on there was a clear trend forming in Halifax's results; they were doing well at home but not well away from home. In fact their first away league win didn't come until mid-December against Dartford, a week after losing their first and ultimately only home league game all season against Woking. Halifax were on the edge of the play-off places but it was a slightly false position as they had played more games than other teams. The home and away trends continued until March when Town got their second away league win of the season at Hyde and it marked the start of an unbelievable run. Including that game and a win against Tamworth the previous week, Halifax went on a 10-match unbeaten which included 9 wins, and during that 10-match run Halifax kept 7 consecutive clean sheets which was one game off equalling the Conference Premier record. The run saw Town go from mid-table to 5th place and a place in the play-offs, an incredible achievement following promotion the previous season and their part-time status – Halifax finished as the highest part-time side in the league and hence the country. Town met Cambridge in the play-offs hoping to avenge their defeat at the start of the season. They won the home leg 1–0 thanks to a Lee Gregory goal. Club legend Gregory had scored 32 goals in all competitions for the Shaymen and was instrumental in captaining the side to the play-offs following an injury to club captain Danny Lowe earlier in the season. Halifax were effectively a draw away from reaching the play-off final and a trip to Wembley for the first time in both the new club and the old club's history, however they lost 2–0. Halifax's season ended exactly where it had begun – with a defeat at Cambridge. Just before the start of the season Lee Gregory left for Millwall for a fee of £250,000. Following the unbelievable end to the previous season, fans' expectations for the new season were raised to unhealthy levels. To try and match the previous season's play-off finish. Manager Aspin brought in Macclesfield top scorer Scott Boden and young striker Richard Peniket from Tamworth to try and fill the void left by Gregory. Some impressive pre-season results and five consecutive wins at the start of the season increased fans' expectations even further as Halifax sat clear at the top of the league. Inevitably they dropped off slightly but still picked up some credible results in September as they ended the month in second place. A poor run in October and November with only one win in eight games saw Halifax drop as low as 11th place. However within this poor league run was an FA Cup run which saw Halifax get drawn against local rivals Bradford City. Halifax lost the match 2–1 in front of a new club record 8,042 fans at The Shay which marked the start of Bradfords infamous cup run in which Bradford reached the Quarter-finals. To say that Bradford stunned Chelsea 2–4 in there cup run at Stamford Bridge Halifax played very well to only lose 1–2. Halifax improved from the end of November with some good results and by mid-February were well in the play-off hunt sitting in seventh with a few games in hand following a few postponements, due to the poor weather and the Shay pitch's inability to recover, and a good FA Trophy run as Halifax reached the quarter-final for the second time in three years, losing to eventual runners-up Wrexham. Halifax ended the season with a couple of impressive results, namely draws against league champions and runners-up Barnet and Bristol Rovers respectively. However these two draws were part of nine that Halifax drew in their final 15 games which saw them drop away from the play-offs, and they only won one of those 15. They did, however, finish as the third highest part-time side in the league. A stuttered end to the season didn't go down well with a loud minority of fans who unrealistically believed Halifax should have made the play-offs at the very least, if not challenged for the title. Realistically, the season was promising if frustrating at times as Halifax lacked the firepower and the consistency from the previous season which ultimately proved the difference between a good season and a great one. Perhaps the most disappointing aspect of the season was the way Halifax dropped off after having been in the top three for the first third of the season but, as a part-time side, being in those positions for so long was an achievement in itself. Town manager Neil Aspin brought many new faces to The Shay before the start of the season, including striker Jordan Burrow and defender Hamza Bencherif from Lincoln and winger Connor Hughes from the newly renamed Hyde United. Expectations were generally high but the season started disastrously. The club lost its first four games in the National League and collected only 5 point from the first ten fixtures, culminating in a 2–1 defeat to rivals Guiseley. Aspin was sacked after the game, parting ways with the club after 6 glorious years which saw them climbing from the eighth tier to the fifth. Aspin was quickly replaced by Darren Kelly, who had recently been sacked as manager of League One side Oldham Athletic. Under Kelly, Halifax lost 6 out of 7 games they played, including humiliating defeats to Grimsby (7–0 away), Cheltenham (1–7 home) and Braintree (3–6 home). The latter one was the last straw and Kelly was sacked after less than two months with the club, to be replaced by his 58-year-old assistant Jim Harvey on a caretaker basis. During Kelly's tenure Halifax were eliminated in the first round of the FA Cup, too, as they succumbed 4–0 at the Shay to League Two club Wycombe Wanderers. As for their league position, they were rooted to the foot of the table with only 10 points after 20 games, and relegation to the National League North seemed inevitable. Harvey's appointment, however, turned on a switch for the club and they went unbeaten for the next 10 league fixtures (5 wins, 5 draws), a run that included impressive wins at Gateshead (4–1) and against high-flyers Dover Athletic (4–2 at home). After just eight league games under Harvey, Town was out of the relegation zone, and Harvey was appointed as permanent manager. Their league form slightly deteriorated afterwards, however, a remarkable run in the F.A. Trophy contributing. In the latter competition, Harvey's men thrashed Tamworth 5–0 in the first round, and then beat both Barrow and Chester 1–0 at The Shay to qualify for the quarter finals. Then they meat Gateshead, a club managed by former Shaymen manager Aspin. An unremarkable goalless draw at The Shay meant a replay at Gateshead was needed. There, Halifax scored in the last minute of the game to equalise (2–2) and force extra time, which saw each team scoring once to take the game to penalties. The Shaymen won the shoot-out 5–4 and qualified for the semifinals for the first time ever. Level 7 outfit Nantwich Town were their opponents but they couldn't prevent Halifax from a first ever trip to Wembley Stadium, as the Shaymen prevailed 6–4 on aggregate (2–2 home, 4–2 away) to face Grimsby Town in the final. This memorable run took its toll, however, and Halifax won only twice in ten games to drop back into the relegation places with two games to spare. However, these two wins were vital ones, against fellow strugglers Altrincham and Boreham Wood, with Connor Hughes scoring the winning goals in both games. In the penultimate round of the season Halifax stunned second-placed Forest Green Rovers, beating them 1–0 away. Derby County loanee Shaq McDonald was the scorer, and the Shaymen were once more out of the drop zone, surpassing local rivals Guiseley. They just had to beat Macclesfield Town at The Shay in order to complete an escape from relegation which seemed impossible when Harvey took over in late November. However, they only managed to draw 1–1 despite taking the lead and, with other results going against them, they were relegated back to the National League North. Despite relegation, the Shaymen were determined to end the season in a high note, as a first-ever trip to Wembley saw them beat Grimsby Town 1–0 in front of more than 10,000 Town supporters. Left-back Scott McManus scored the only goal with a fine curling effort after 48 minutes. A troubled and miserable season for Halifax ended with a moment of glory, as they lifted the FA Trophy at Wembley. Despite this, manager Harvey's contract wasn't renewed and soon after he was replaced by North Ferriby United manager Billy Heath, who had just guided the Villagers to promotion from the league Halifax were about to enter. Town were made second favourites for the league behind big spenders Fylde after signing a number of players from Heath's former club North Ferriby, who had finished 2nd and won the play-offs in the previous campaign, including big striker Tom Denton and captain Liam King, as well as Boston United captain Scott Garner, Guiseley's stalwart keeper Steven Drench and winger Matty Kosylo who had impressed for Nantwich in the Trophy semi-final. Town started the season with victory at Nuneaton and had some impressive results with home victories over Worcester City and Tamworth as they raced to the top of the league after 5 games. A poor August bank holiday weekend saw Town narrowly lose at Fylde in the battle of the favourites before a poor display in a home defeat to Harrogate Town saw Town drop from 1st to 10th in three days. The team recovered and won their next game at Telford before salvaging a point with 10 men at media darlings Salford City. Another poor performance at home to strugglers Stalybridge Celtic ended with an unconvincing win before a defeat at Gainsborough Trinity who seemed to score with every attempt they had. This proved to be Town's "Vauxhall moment" as they went on to win their next seven in all competitions, including impressive wins over Gloucester City and Harrogate Town, to propel them up to 3rd in the league. An unlucky defeat against an impressive Brackley Town in the first meeting since the play-off final ended the run. Town then had a tough FA Cup test at National League high-fliers Dagenham & Redbridge. The Shaymen put in an impressive shift to bring the Daggers back to West Yorkshire for a replay after a goalless draw. Town made hard work of the replay after outplaying their higher league opponents but nicked a late winner to send them through to the 2nd round at Eastleigh. This defeat seemed to take its toll on Town as they went down at Curzon Ashton in the next game, who finished with 8 men and won their first home league game of the season. Town were beginning their defence of the FA Trophy at Matlock Town but could only draw after a late equaliser. The replay showed no improvement as Town lost to the team from a division below and the Trophy defence had ended without even qualifying. Next up was the cup tie at Eastleigh; Town went 1–0 down but stormed back to go 3–1 up but just couldn't hold on to cement their place in the 3rd round. Hopes were high for the replay but Eastleigh won it 2–0 to extend Town's winless run to five, though four of those games were in cup competitions. Upon returning to league action nothing improved as Town salvaged a draw with a late, late equaliser at home to Telford. Eastleigh away aside, Town hadn't put in a good performance since the Dagenham & Redbridge replay and questions were starting to be asked of manager Heath. The Christmas double header with Darlington saw Town take just a point before travelling to second-bottom Stalybridge Celtic where the home side nicked a late winner to send Town winless at ten. The majority of the fanbase were calling for Heath to be sacked following the poor run and shoddy performances despite still being in a reasonable league position. Town defied all expectations by beating 3rd placed Chorley in the next game before hitting fellow play-off rivals Tamworth for 6 and coming from 2–0 down to beat Salford City 4–2 to return to the play-off spots. They also played a narrow draw at home to Stockport County which attracted an attendance of 2,900, the largest of the season at that point. After a strong second round Halifax Town clinched their playoff place relatively easily, finishing in 3rd place. Their semifinals opponents were 4th-placed Salford City, and both games finished in 1–1 draws. A penalty shoot-out was needed, and won 3–0 by Halifax, meaning that the Shaymen faced Chorley at the Shay with promotion up for grabs. Almost 8000 fans, including almost two thousand Chorley supporters attended a dramatic final, with Halifax winning 2–1 after extra time to bounce back from relegation at the first attempt. Spanning three seasons, Halifax went 30 league games at the Shay unbeaten. The run ran from 18 April 2009 to 20 November 2010, beginning as a disappointing 2008–09 season was coming to a close with a 1–2 defeat to Curzon Ashton, which ended any hopes of a play-off place that year, and cemented Curzon's. They won 18 and drew 3 at home in the 2009–10 season to seal the Northern Premier League Division One North championship. A slow start to the beginning of the 2010–11 season seemed to spell the end of the home run very soon, but with the return of injured left and right-backs Danny Lowe and Aaron Hardy respectively, as well as talismanic striker James Dean, Town's season quickly took off and they rose to top spot in the league. The run finally came to an end on 20 November 2010, when North Ferriby United beat Halifax 0–2. In cup competitions Halifax only lost two games during this spell, both 0–1 defeats to Conference Premier opposition, a league which was 3 above Halifax's in the 2009–10 season and 2 in the 2010–11 season. Halifax Town's traditional colours are blue and white. The club doesn't have any particular, identifiable style and as such there can be quite a change of style season upon season. 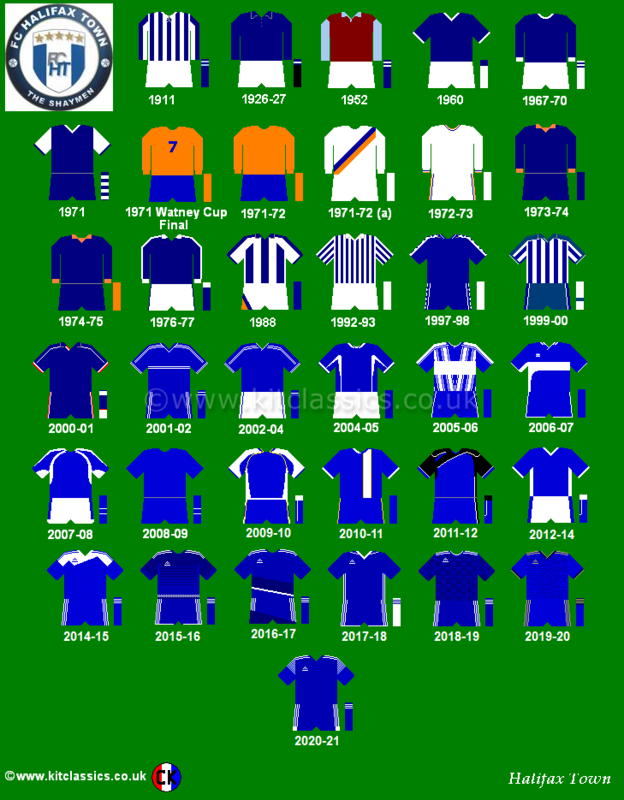 For the majority of Halifax Town's existence the club has opted for blue shirts, blue shorts and blue socks with various different styles on the shirt. This rhythm was interrupted between 2011 and 2014 as in the 2011–12 season the kit was blue with black trim as opposed to white, and between 2012 and 2014 the club wore blue shirts, white shorts and blue socks. As Halifax Town (AFC) the kit was also variable, including full blue, blue with white shorts, blue and white stripes and in the 1970s the kit included orange and even full white kits with orange. According to a survey conducted in 2003, Halifax's three main rivals are Burnley, Rochdale and Huddersfield Town. The rivalry with Burnley began in the 1980s when Burnley dropped into the Fourth Division and a number of intense affairs between the two clubs when the teams played sparked a rivalry. Despite not having met since and rarely beforehand, Halifax fans still view Burnley as being the club's biggest rival and make reference to it in several chants. Halifax have met Rochdale well over 100 times in the Football League and like the Burnley rivalry has formed due to the Yorkshire-Lancashire connection and being one of the nearest towns to Halifax, albeit over the Pennines. Rochdale are the club's oldest traditional rival and many of the older generation of supporters still see them as the primary rival. The Huddersfield rivalry comes from the proximity between the two towns, being just 8 miles apart. Like Burnley, the two clubs have rarely met due to Huddersfield usually being in a higher division but the fans still see there as being a rivalry. Other rivals include Bradford City and York City. Despite Bradford being a similar distance away from Halifax as Huddersfield is and having met each other far more times, isn't considered as fierce a rivalry. York, although around 35 miles away, have a competitive rivalry with Halifax, particularly as the two were the only Yorkshire representatives when playing in the Conference Premier in the mid-2000s. Barnsley and Oldham Athletic were both considered rivals in the past; neither have played Halifax in a league fixture since the 1970s. When Halifax were demoted to the regional leagues some of the smaller local clubs tried to form competitive rivalries but none of them really took off. The biggest of these rivalries was arguably with Guiseley as the clubs met several times and during Halifax's time in the Conference North the two clubs were both pushing for the play-offs. The rivalry has since declined and has become more of a friendly one as several ex-Halifax players now play and manage there. A small rivalry formed with Chester during their season in the Conference North as the two clubs were the two big, ex-league clubs and had gone through an almost identical fate, having been liquidated and demoted three leagues. Smaller rivalries were also formed with Bradford Park Avenue and Harrogate Town. In 2018, Reece McLaren, a Huddersfield Town fan was jailed for 20 weeks and banned from all football for 8 years after an for unprovoked attack on a Halifax Town supporter. McLaren pleaded guilty to affray and was jailed at Kirklees Magistrates Court. Matchday Photography: Adam Cheshire, Kelly Gilchrist, Darren Murphy, Greg Stainton, Kane Styles. 2014–15 Conference Premier 5 46 17 15 14 60 54 +6 66 9/24 Lois Maynard (11) R1 QF 1,472 Halifax finished in a respectable position of 9th, however the season deteriorated from February onwards. Relegated Jordan Burrow (14) R1 W 1,546 Town were dead and buried by mid-November but a revival gave them hope before ultimately running out of steam. the competition due to fielding an ineligible player. ^ "Season tickets". F.C. Halifax Town. Retrieved 21 May 2018. ^ "BBC SPORT – Football – My Club – Halifax – Halifax on the brink of collapse". ^ "FC Halifax Town Clockwatch: Friday November 28". ^ "BlueSq Premier – North – South – Latest news on the new Blue Square Premier, North and South season – Conference AGM news". Archived from the original on 12 June 2008. ^ "BBC SPORT – Football – Non League – Halifax fail with demotion appeal". ^ "FC Halifax Town 0 Wrexham 1: Aspin so proud after late goal heartbreak". ^ "FC Halifax Town 4 Lancaster City 0: Town move closer to title". ^ "Blue Square Bet North play-offs: FC Halifax promoted". BBC Sport. 12 May 2013. Retrieved 12 May 2013. ^ Kit classics Halifax, "http://www.kitclassics.co.uk/kits/halifax.png"
^ Football Fans Survey, " "Archived copy" (PDF). Archived from the original (PDF) on 20 October 2013. Retrieved 2012-02-07. CS1 maint: Archived copy as title (link)"
^ Footy Mad Head-to-Head, "http://www.footymad.net/head_to_head/rochdale/vs/fc_halifax_town/index.shtml"
^ "Huddersfield fan jailed for unprovoked attack on Halifax fans". ITV. 16 February 2017. Retrieved 14 December 2018. ^ Cooper, Louise (16 February 2018). "Huddersfield Town fan jailed for 'unprovoked attack' on teenagers". Examiner Live. Retrieved 14 December 2018. ^ "First team: 2018-2019". F.C. Halifax Town. Retrieved 1 October 2018. ^ "Grimsby 7 – 0 Halifax". BBC Sport. BBC. 13 October 2015. Retrieved 14 October 2015. This page was last edited on 19 April 2019, at 08:50 (UTC).